In his brief 30 months in the Vatican, Pope Francis has shown himself unafraid to venture forth from the cloisters into the messy world of politics in pursuit of his spiritual agenda. Nowhere was this more evident than in the key role he played in restoring diplomatic relations between the United States and Cuba earlier this year, ending 54 years of bitter isolation. Francis worked through his local representative, Cardinal Jaime Ortega y Alamino of Havana, exploiting the Catholicism that is still strong in country, despite 56 years of communist rule. Last month Francis wowed the Cubans on his first visit there. He then completely upstaged President Xi Jinping on his first papal visit to the United States (US) at the same time as the Chinese leader. The pontiff was given the rare honour of addressing a joint sitting of both houses of Congress. He used the podium to deliver some fairly blunt messages – even if tactfully packaged – to the US legislators, urging tolerance toward immigrants and opposition to the death penalty, capitalist greed and climate change. He also addressed the United Nations General Assembly, a powerful symbol of his still-growing ability to reach to all corners of the planet. Because of his sympathy for the poor and downtrodden, most of this Argentine pope’s visits, though, have, unsurprisingly, been outside the developed world, or on its peripheries. Francis has visited Brazil, Paraguay, Bolivia and Ecuador in his native continent; Israel and Palestine, Turkey and Jordan in the Middle East; Albania, Bosnia and Herzegovina in the Balkans; Sri Lanka in south Asia; Philippines in south-east Asia and South Korea in east Asia. In Europe he has only visited France, very briefly. Even in the US, he made a point of visiting what one might term the local developing world, including a shelter for the homeless in Washington, immigrant schoolchildren in Harlem and convicts in Philadelphia. On a visit to the Holy Land last year, Francis ventured across the deep political and religious divide between Jerusalem and Bethlehem and persuaded Palestinian President Mahmoud Abbas and Israeli President Shimon Peres to join him for a prayer for peace at the Vatican a few weeks later. It was the first Vatican prayer meeting of two leaders engaged in conflict and that made it a powerful symbol of reconciliation. Francis has also moved into the minefield of Chinese politics, showing a deft political touch, and a flexibility or moral principle (some might think too much so) by refusing to meet the Tibetan spiritual leader, the Dalai Lama, when he visited Rome last December. That helped persuade Beijing to allow the rare ordination of a Roman Catholic bishop in central China. Yet, mixing politics with religion can be a risky enterprise – even for a man of his humility, empathy, tact and skill. In the Middle East, where that mixture is most volatile, his support for US President Barack Obama’s nuclear oil deal with Iran has annoyed Israel, as has his recognition of Palestine’s statehood. But his refusal to back the raising of Palestine’s flag at the UN of course irked them too. And this week, Francis was forced to a call on the antagonists ‘to say no to hatred and revenge’ as accelerating violence threatened to plunge Israel and Palestine into a third intifada. The Pope’s one known venture into African politics has also had mixed results. In 2014, the Vatican negotiated an agreement with the government of Burundi, which guaranteed the legal status of Catholic doctrine in matters such as church education and marriage. That made sense in a country where two-thirds of the population are Catholic. But that harmony with the state has been jeopardised by the Burundian Catholic church’s public opposition to President Pierre Nkurunziza’s election to a third term, overriding the two-term limits of the constitution. Next month, Francis plans to stride even more boldly into a hornet’s nest of religious hatred when he visits the Central African Republic (CAR) on his first papal visit to Africa, which will also take in Kenya and Uganda. The putsch by Séléka rebels, which toppled President François Bozizé in March 2013, has descended into horrible sectarian violence between the mostly Séléka militias against mostly Christian, anti-Balaka counterparts. A new upsurge in violence has just forced the indefinite postponement of elections and a constitutional referendum, which were to be held this month. Francis is due to visit a refugee camp and the Koudoukou mosque to meet leaders of the Muslim community in Bangui before winding up his visit with a final mass in Barthelemy Boganda football stadium. In Kenya, Francis is to tour the Kangemi slum in the capital Nairobi – home to about 100 000 people, including 20 000 Catholics. The Pope will meet leaders of all the main faiths in Kenya to try to promote religious reconciliation in a country where increasing terror attacks by the violent Somali Islamist group al-Shabaab, and the often indiscriminate retaliation by security forces, are stoking religious and sectarian hostility. The volatile, inter-religious tensions in CAR and Kenya are raising concerns about the Pope’s personal safety, especially because of his propensity to depart from his itinerary – and his Popemobile – to mingle with the crowds. In Entebbe in Uganda, Francis will honour the first African saints – 22 young people killed in 1878 on the orders of the local ruler because they refused to renounce their Christian faith. All three countries in his itinerary have significant Catholic communities. 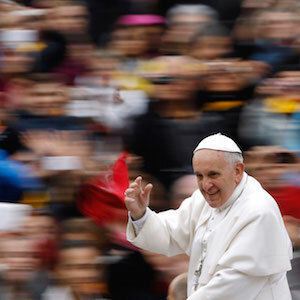 By the nature of his calling, Pope Francis is best placed to tackle religious conflicts, particularly those involving Christians, and so CAR and Kenya are logical destinations. Most of the religious conflicts in the world today, however, do not involve Christians. More involve Muslims, and the bitterest strife is within that faith between its Sunni and Shi’ia sects.